Want to guarantee yourself a steady, well-paid career? Major in engineering. Want to take a shot at striking it rich? Then major in economics. Majors that emphasize quantitative skills tend to have graduates with the highest lifetime earnings. 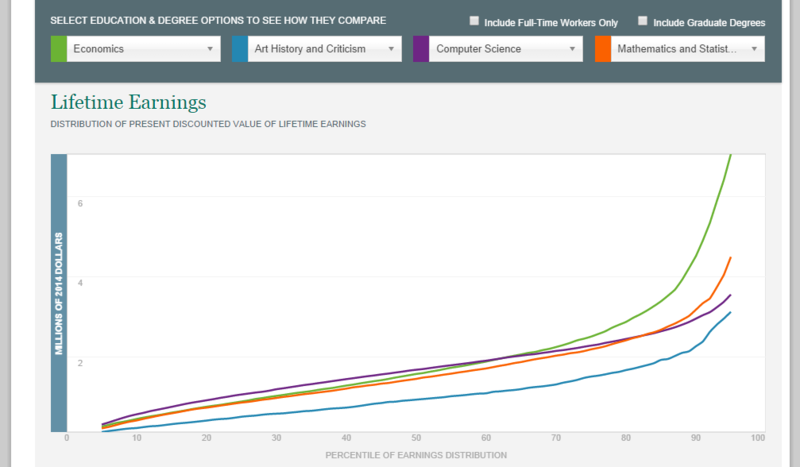 The highest-earning majors are those in engineering fields, computer science, operations and logistics, physics, economics, and finance. Economists surpass engineers at about the 60th percentile and the highest-paid econ grads can expect to make $3 million more (in NPV terms) than the highest-paid engineering grads. Notice that economics and business management are not close substitutes at all in the figure, as the management grads don’t fare nearly as well at any point in the distribution, and certainly not at the top. That observation is possibly consistent with some evidence on who becomes a CEO. The lifetime earnings calculation is not a straight number, but a present value calculation at a 3% discount rate. To provide a wee bit of perspective, an individual that graduated college into a $50,000 per year job and got a 3% raise every year would retire at age 65 with an income of approximately $175,000. The NPV of that individual’s lifetime earnings would be just north of $2 million, which is right about the median lifetime earnings of a typical engineering and econ graduate. Not bad, but not exactly the 1%, either. The interactive tool is pretty cool. I changed the majors to include computer science, mathematics, and art history. Predictably, the art history majors lag behind the other disciplines, but it is interesting to note that the top-earning, say, 10% of art history graduates have lifetime earnings higher than about 70% of the economics graduates. The thread title, of course, is a quote from Ben Loman. Students who have taken intro or who have Advanced Placement credit should consider taking 200-level classes based on their own interests (e.g., 200 Development Economics, 205 International Economics, 245 Law & Economics, 280 Environmental Economics). Sophomore year is a good time to take ECON 225 Decision Theory. This is not a required course, but we recommend it for all majors and minors. The introductory mathematics courses are essential because they are foundational both to intermediate theory courses and to elementary statistics. Calculus (MATH 120 and 130 or MATH 140) is a prerequisite for ECON 300 and ECON 320. Calculus is also a prerequisite for Statistics (MATH 207), and Statistics (MATH 107 or the equivalent) is a prerequisite for ECON 380. Sophomore: Intermediate sequence (ECON 300, 380, 320), 200-level courses based on student interest, Statistics (MATH 207 107). ECON 300 and MATH 207 107 are offered in the fall. MINOR: At this point the minor requirements are indeed minor. No significant planning is necessary during the Freshman year to complete this degree, though our recommendations in terms of taking introductory economics and mathematics courses remains the same for majors and minors alike.